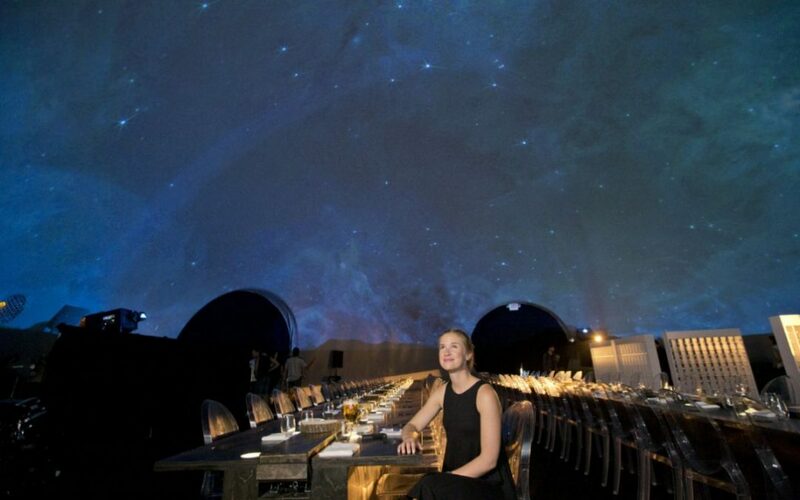 (The Star, by Katrina Clarke) – The multi-sensory, 360 degree dining experience, hosted in a three story dome is sure to shake up your senses. Your first course comes served on a trowel in a garden planter. Your third is a soup that mixes to the beat of a drummer playing live in front of you. 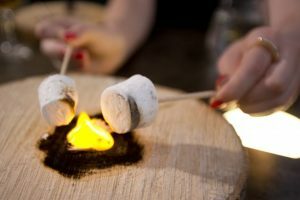 Your fifth is a campfire-inspired dessert you roast over an open flame. Welcome to Sensorium, Toronto’s 360-degree sensory overload dining experience. Hosted in a 18-metre-wide dome resembling a mini Epcot centre, the event is a five-course, multi-sensory marathon. It’s the first of its kind from Stella Artois, which selected Toronto as its global premier location because of the city’s ongoing winning streak, including everything from on-fire Blue Jays to a successful Pan Am Games to TIFF, and it’s an immersive VIP experience sure to leave guests’ senses buzzing. The Star got an exclusive first seating this week. Along King St. W., the three-storey dome popping up behind Starbucks in a parking lot is a curious sight — and the red carpet, security guard and circle of gold surrounding the entrance only compound the mystery of what’s inside. Stepping through an unzipped flap in the dome, I felt like Alice falling down the rabbit hole. A starry sky carpeted the curved ceiling above me, two hundred Stella chalices decorated a movable wall before me and mellow loungelike music flowed through the room. A glass of Stella was soon in my palm and an apron-clad hostess was leading me to my seat — I was the lone diner in a room that seats 80 people. Seated, I tried to decipher what was edible in the vegetable-filled garden in front of me. A server explained that everything was edible — including the dirt, but excluding the trowels. As a gold circle stretched outward from the centre of the sky, chef Richie Farina, a Michelin Star-awarded chef formerly of Moto in Chicago, announced that the night’s experience was created around Sensorium’s muse: the Stella chalice. The experience would highlight sight, scent, touch, sound and taste, moving from hot to cold, sweet to savoury and dark to light, he said, explaining that Sensorium’s two-year journey included collaboration with four sensorial experts — himself for taste, Toronto-based director and designer Jamie Webster for sight, sound engineer Nyles Miszczyk for sound and scent expert Irwin Adam Eydelnant, who has a PhD in biomedical engineering, for scent. “Cheers,” Farina said as I raised a glass to a near-empty room and dug into the mushroom soil. As the courses progressed, each had an increasingly creative element or refined touch. The first course was served with a vanilla-y “flavour cloud” that you inhale, the sea-themed course was presented on a large scallop shell surrounded by brine-scented dry ice, the soup course came complete with a live drummer whose music vibrations connected with the speakers under the bowl, causing the broth to jump and mix to the beat of his drum, and the fourth course — “nature’s textures” — featured a “bird’s nest” of braised beef cheek with a quail egg in the centre, covered by overturned glass that released hickory smoke when lifted.